Enjoy a safe, luxurious bath in America’s best walk-in bathtub. 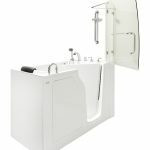 Built by American Tubs in California, USA, our premium walk-in tubs cater to the needs of seniors, people with mobility challenges, and anyone who enjoys a luxurious, spa-like experience when they bathe. With our low-threshold door, entering and exiting your tub is easier and safer than ever. Built-in safety features help you avoid the risk of falling in the bathroom, so you can relax and enjoy bathing again. 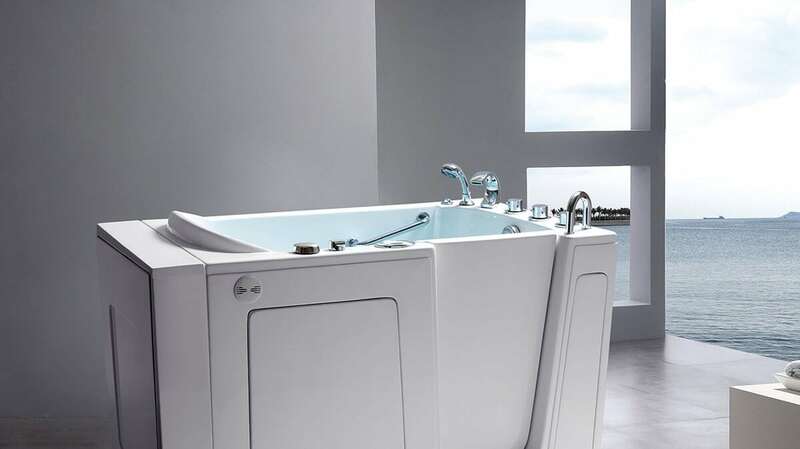 American Tubs is known for premium quality and exceptional service. Our local dealers and installers can install your new walk-in bath in as little as one day. A walk-in tub is a treasured investment. So, don’t wait! 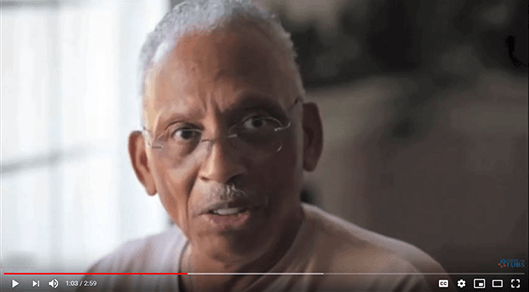 Get in touch with us today to learn more about our fully-customized walk-in bathtubs and how they can help you remain in your home for as long as possible. Get a $600 Coupon & Save on a New Walk-in Tub! All American Tubs walk-in tubs are constructed with a heavy-duty fiberglass shell reinforced with a stainless steel frame. Our walk-in baths are coated with an easy to­ clean, high-gloss finish and anti-slip, textured floor. 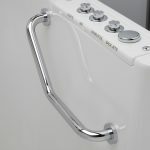 Our tub design includes a built-in safety grab bar, placed next to the ergonomically designed door. The lightweight yet heavy-­duty reinforced door system is built with a silicone rubber seal and an easy-release handle for ease of use. Visit our Features page to discover our range of standard features as well as available options. 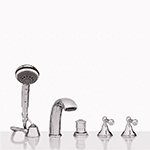 Each American Tubs walk-in bath comes with a high-quality, 5-piece Roman faucet set. Our standard grab bars help you maintain stability as you enter or exit your walk-in bath. 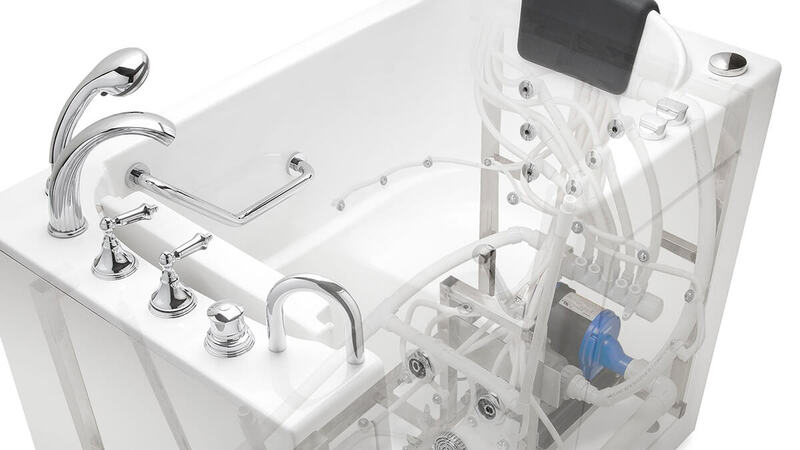 Our tubs come with easy-to-use controls made for seniors and those with mobility issues. Get a custom-built walk-in tub to suit your individual needs and desires. We can customize your new walk-in bath with a wide selection of features, including air massage, hydro massage, chromatherapy, aromatherapy, a micro-bubbles system, and a quick drain — our patented 2” Hurry Drain® system. Questions? Don’t hesitate to contact us today! Reach us toll free at (800) 577-8475. Enjoy soothing hydro massage therapy at home. Choose from air jets, hydro jets, or a micro-bubbles system. 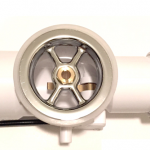 Our optional Hurry Drain®, with its patented design, can drain water from your tub in 110 seconds depending on your current plumbing. This makes it possible for water to drain three times faster than with a conventional drain. Our available shower slide bar and door options make it easy to take a shower in your walk-in tub! Each tub that passes through our factory meets the highest UL certification standards for safety and quality. We want your walk-in tub to be a lasting investment. Therefore, we don’t use acrylic molds which can crack and fade easily. We craft our tubs with the highest quality marine grade fiberglass on the market, and we coat it with a triple gel coat finish for additional strength and longevity. Finally, we place your tub in a sturdy, one-piece, stainless steel frame. A walk-in tub from American Tubs truly is the finest walk-in tub on the market. 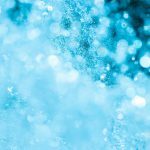 By harnessing the healing powers of warm water, hydrotherapy is proven to promote the release of endorphins in your body. This creates varying benefits for your health. Whether you are looking to reduce muscle soreness, boost your immune system, increase flexibility, rehabilitate injured muscles, or simply relieve stress, American Tubs walk-in tubs provide you with the ability to do this in the privacy of your own home. Choose from our nationwide list of dealers to find the perfect fit for you. To ensure that your installation goes smoothly, our factory trained, thoroughly vetted dealers have years of experience with walk-in tub installation. You will be pleased with our courteous and professional dealers who will work diligently and swiftly to install your new walk-in tub, leaving your home clean and tidy once the installation is complete. Financing is available. Contact us to learn more today! Contact us today to get a complimentary in-home quote! We stand behind our products with a lifetime warranty. *Some conditions apply. "They gave us exactly what we're looking for. They came in, did the demolition, and they did everything exactly like they were supposed to do it. I was quite happy with the work and with the excellent crew. And they did everything the way it's supposed to be done."